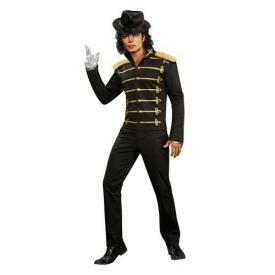 My Family Fun - Michael Jackson military costume King of Pop! Based on one of Michael Jackson's signature accessories, no costume of the King of Pop would be complete without this Military Printed Jacket with gold details, matching pants and gloves. Re-live your favorite Michael Jackson music videos...order yours today! Includes 80s styled Black Jacket Available in Mens Standard Chest Size 42"-48". Planning on going out with a group? Stay in the 80's theme with our wide variety of costumes for Adults and Kids! The group that dresses together stays together!